First project up and running. 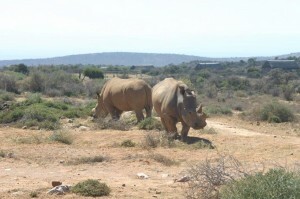 We came across these two rhinos almost a year ago , unfortunately, the female was slaughtered and the male attacked but he survived. Please check latest posts for updates. New hope for Pride and a new companion – Joy. Money has been raised and the following implemented. 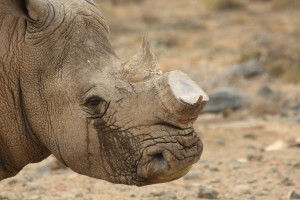 To buy a female rhino - the right size, age, half horn etc – R575,000 – raised. Ongoing costs for full 24 hour APU- R25-30,000 (£1500) p.m. – please donate towards. 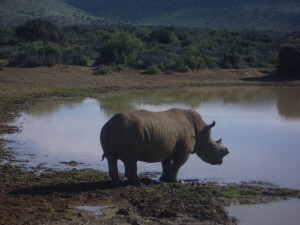 Ongoing costs for adoption of each rhino – R2500 (£140) p.m. X 2 – please donate towards. If you wish to help this particular cause then please mark your doanations or forward an email with Reference – PRProject1. We have had an eventful few days at farm as one would expect, filled with emotions, excitements, concerns as one would expect. In a nut shell, Joy was delivered quite late at night (2 am) and the weather was horrible so we decided to leave the off loading until early morning. This was a good call for the container she was in didn’t match our off loading boma, so we had to do come up with a genius idea to make it work. The off loading was a big success and she just walked out of the container into the boma and started eating within 15 minutes. After a good 48 hours in our boma, we checked up her slava, urine and dunk for signs of any internal damage which might have occurred during transport, thankfully she is in good health. After the effect of the long acting sedative over 72 hours, Joy was released to the open section of the boma where she enjoyed the larger space, a mud bath and sounds and smells of her new home. Joy stayed in this facility for a total of 7 days, spending her day time in the open section and sleeping in the wooden boma – at her own free will. She also seemingly has put weight on in this period which was part of the plan before being released to open veldt. On Thursday – Pride realised Joy’s presence and found her in the boma and from there on he wouldn’t leave her the site. She was nervous at first and kept returning to the enclosed section. It was not long though before they started chatting with whistles and calls and started sleeping next to each other on each side of the fence. Our release effort on Saturday morning turned into a mission. 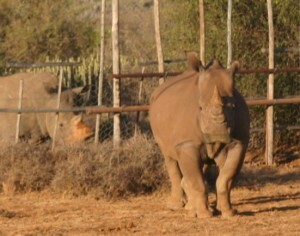 Firstly she didn’t want to leave the boma, despite the gate being left wide open. We put some lucern at the open gate for her to go there and just to walk out, but she didn’t. Sometime later Pride walked nearby and saw the lucern and started chomping away. Joy was than interested and approached Pride. They then both realised that there was no fence between them and approached each other and sniffed. This romantic scene was a fine moment but followed by a major drama! Pride decided to show her who is wearing the trousers and stormed her, pushing her against the fence. The commotion ended with Joy running back into the closed boma. We chased the testosterone filled Pride out of the fenced section and closed the gate, resulting in being back to square one, with an agitated bull and a scared cow. We gave them both some lucern, as far away from each other and called it a morning. In the afternoon luck was on our side. We found Pride trying to get in from the back of the wooden section, which gave us an opportunity to close the road gate and encourage Pride to come back to the open section. This time Joy wouldn’t go the in the opposite direction from him so we had to basically push her out. Once she left the boma she just started walking towards the wind and walked about 300m before stopping and looking back, then proceeded to lie down. We opened the road gate and Pride came back but no matter how much we tried he didn’t realise Joy had left the boma. 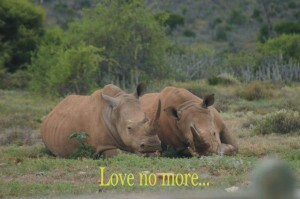 We thought she would come back to the boma at night and he might still be there and hence they would meet again. The biggest risk in the entire story is that Joy will not get along with Pride or vice versa and end up walking away!! The Monday morning brought different surprises. We found Pride at the lodge, bright and early but no sign of joy. This really hit home, as we thought our assumption of her coming back to the boma to be together hadn’t materialised. This disappointment turned to horror when we went to the boma and realised in fact she had been at the boma and it looked like a major commotion had occurred between them. It was like a battle scene with pushed down fences, big scratch marks on the ground, etc. It was not possible to figure whether this was some sexual activity or a big fight between the two of them. We went out on horseback to track her down, to see if she is all right, alive, etc?? 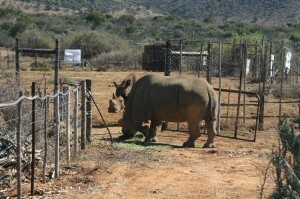 After a lot of stressful hours we found Joy and she looked in good health despite being ‘rhino handled’ by Pride. Monday night we heard another commotion again near the boma but from the sounds it appeared okay and they seemed comfortable together and not aggressive. Tuesday morning they both came to the boma and fed together, despite Pride still acting territorial especially when food is involved but there was not a physical fight. All has since been well. Yesterday we had the Vet visit so we could dart Joy and check, disinfected her wounds from the earlier commotions with Pride. The call proved prudent, because one of the wounds turned out to be deeper than appeared and might have caused a problem if not treated. So the Vet sorted out the cleansing of the wound and Joy was prescribed and administered slow acting penicillin, a multivitamin booster to support her and boost her appetite. Joy has good teeth and the vet confirmed Joy is not pregnant, she is age between 8-12 and sexually mature with all genetics are in good order. Pride reacted to the smell of the antiseptic which was sprayed on Joy at first but calmed down later. Pride and Joy had their breakfast together them and then had a nice nap in noon sun. Will keep you posted on further news. 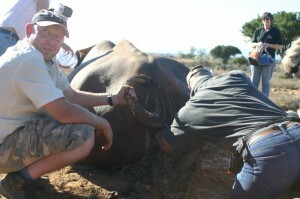 We would like to thank you for all the help and money raised by your fantastic charity ‘Poached Rhino’.